WHETHER it’s redesigning the Presidential Suite at a Melia hotel, or a luxury villa in Norway, the team at Estuco Interiors never take their eye off the ball. With an incredible vision and passion for creativity, it is little surprise they have grown consistently for the last two decades. 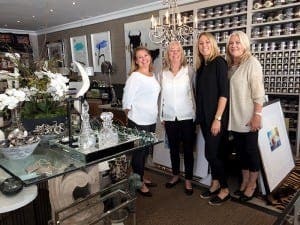 Now one of the coast’s leading interior design companies, the team of four professionals have never been busier. “The coast has completely come alive and around 80% of our quotes are being accepted so we have a lot of work.” explains Christel Jurgensen. Based out of a fabulous flagship showroom in Centro Plaza, Mar-bella, the team offer bespoke designs perfectly tailored to meet your needs – however whimsical they may be. The group of multilingual designers manage every aspect and detail of a project from conception to completion. And they have built up a trusted network of craftsmen, builders, painters, electricians and suppliers who are always on time, on spec and on budget. The versatile team takes on residential, hospitality and restaurant projects and clients may choose from a huge range of fabrics, object d’art and the in-demand Farrow & Bail range.